Kiss me I’m Irish! You’ve seen the shirts, hats, and pins worn on St. Patrick’s Day. This year St. Patrick’s Day is Friday, March 17. So, pucker up and get ready to wear green, watch out for those pesky leprechauns, and look for gold at the end of the rainbow. These traditions we know well, but do you know about the holiday and how it became a holiday in the first place? You might be very surprised to find out more about Saint Patrick. 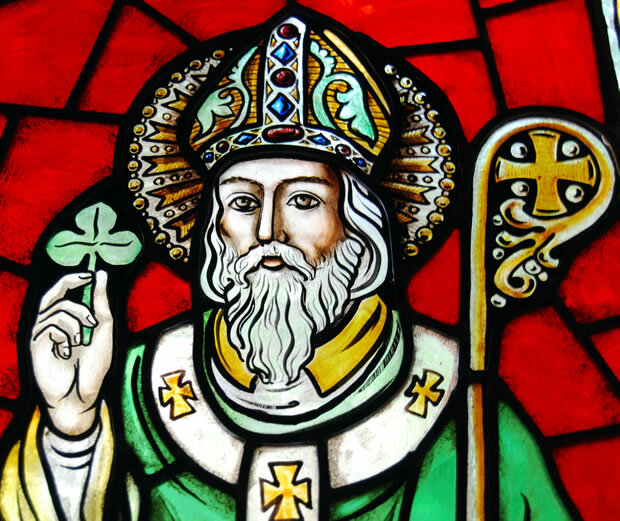 To start, St. Patrick, born in the fifth century, was not even Irish. That’s right! Saint Patrick was born in Britain. At the age of 16, he was kidnapped and held hostage by Irish raiders. He spent six years held in captivity, enslaved as an Irish herder. During this time, he sought comfort and converted to Christianity. After escaping captivity, he returned to Ireland and reunited with his family. Seeking to become a bishop, St. Patrick studied for priesthood and became ordained. His writings in his book “Confessio” spoke of his hearing voices. He believed these voices were pleading with him to return to Ireland to lead the people there to Christianity. In the year 433, Patrick returned to Ireland and began teaching and converting thousands, spending the rest of his life there as a Christian missionary. Before his death on March 17, 461 St. Patrick was given credit for converting Ireland to Christianity. Many myths and falsehoods have surrounded St. Patrick. It is said that he stomped all of the snakes out of Ireland. In actuality, the water temperatures surrounding Ireland are too cold for snakes to migrate and, therefore, they do not exist in the country. The shamrock, or three-leaf clover, got its connection to St. Patrick because he often used the flower to explain the Holy Trinity. In t he eighteenth century, the shamrock was worn on lapels to symbolize Irish Catholic nationalism, and was prominently displayed during the United Irish Uprising in 1798. The original color for St. Patrick’s Day was blue, but later green became the color as it resembled the Irish landscape. For thousands of years, the day of St. Patrick’s death has been a national holiday in which observances include church attendance in the morning followed by a celebration of eating and drinking in the afternoon. This observance soon caught hold in other areas of the world and is now the reason for celebration worldwide. The first official celebration of St. Patrick’s Day did not actually take place in Ireland, but in New York City instead. 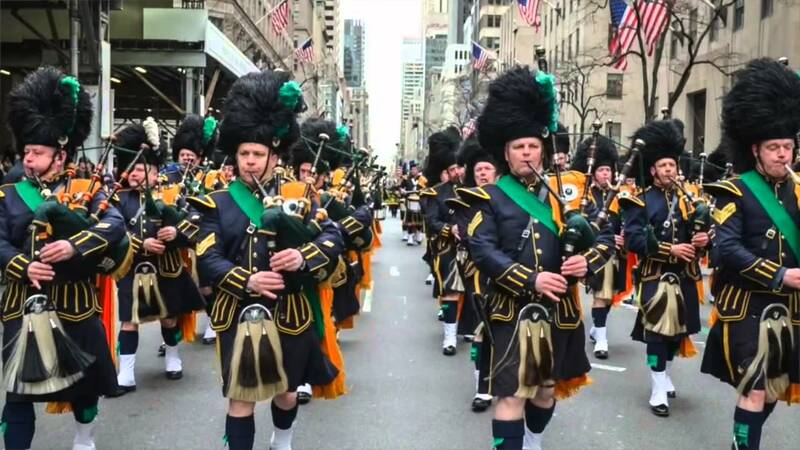 In 1762, Irish soldiers serving in the British military walked the streets, making a historic mark and instituting the first St. Patrick’s Day parade. Since then, St. Patrick’s Day has become a day of international celebration recognizing Irish heritage. The American Heart Association says a body definitely needs some fat. Dietary fats keep the machine that is the body humming by creating energy, protecting organs, stimulating cell growth, producing needed hormones, and helping the body absorb key nutrients. The so-called “good fats” are monounsaturated and polyunsaturated fats, while “bad fats” are trans-fat and saturated fats. The bad fats are responsible for raising the bad type of cholesterol in the body, which is called low density lipoprotein (LDL). This type of cholesterol can increase the risk for atherosclerosis, which is plaque build-up in the blood vessels that limits blood flow. Good fats can lower the levels of LDL, reducing your risk of atherosclerosis and therefore reducing the risk for heart attack and stroke. According to the AHA, monounsaturated and polyunsaturated fats (“good fats”) provide Vitamin E to our diet, an antioxidant that most Americans need more of. Polyunsaturated fats also provide omega-3 and omega-6 fatty acids, which the body needs but can’t produce on its own. Examples of monounsaturated fats include olive, canola, sunflower, peanut, and sesame oils. They are also found in olives, avocados, peanut butter, almonds, macadamia nuts, and cashews. Examples of polyunsaturated fats are found in soybean oil, corn oil, and fatty fish like salmon, trout, or tuna. Walnuts, flaxseed, soybeans, tofu, and sunflower and pumpkin seeds are other good sources of this fat. Saturated fat (“bad fat”) is naturally occurring and is found in high-fat cuts of meat and chicken with skin on it. It’s also in non-skim dairy products like milk, cream, and yogurt, as well as in ice cream, cheese, and butter. Limit meals with animal products to once a day. Try replacing red meat with beans, nuts, poultry, and fish whenever possible, and switching from whole milk and other full-fat dairy foods to lower fat versions. The AHA recommends that adults would benefit from lowering LDL cholesterol by reducing their intake of trans-fat and limiting consumption of saturated fat to 5 to 6% of total calories. “Moderation is the key word,” says Larocco. “For example, if a label for cookies says 0.5 grams of trans-fat per serving (serving size 2 cookies) and you eat 10 cookies, the amount of trans-fat adds up fast.” Larocco recommends reading the complete list of ingredients and staying away from products with partially hydrogenated oil and added sugars. “Our busy schedules today lead many of us to reach for fast food or simple food options which are pre-made; however, we need to limit consumption of foods that come in boxes, bags, packages, or from the fryer,” says Larocco. Check the number of ingredients listed on a product. In general if a label contains more than five ingredients, leave that item behind and go to the fresh fruit and vegetable section. Your heart and body will thank you! 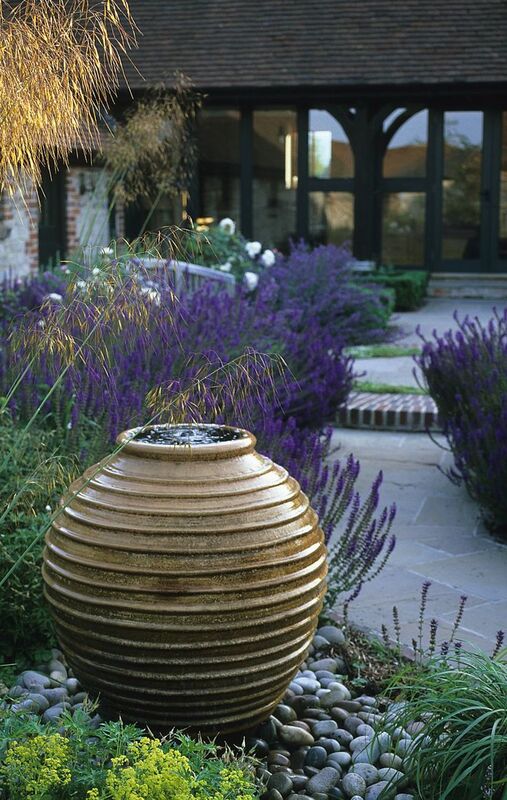 Want to add additional charm and tranquility to your garden? Incorporate a water feature. No matter what size or type of garden you have, there are a number of water features that will fit into any design or space, as well as any budget. A garden pond can add special qualities to nearly any landscape. Vinyl or fiberglass pond liners are widely available at garden centers or through water garden suppliers. These come in a variety of sizes which offer flexible options to easily suit your particular needs. They can also be placed either above or below ground, so if your space cannot accommodate a large water pond, such as with balconies, containers make excellent alternatives. Nearly any type of watertight container can be easily transformed into a miniature garden pond. If it’s not watertight, PVC liners are available at most garden centers which will help to waterproof your container. Half-wooden barrels and galvanized washtubs are the most commonly used. Place your pond in a location that receives at least 4-6 hours of full sun. Make certain that your site is leveled off as well. If your space permits, stick your mini pond in the ground to help minimize the chances of it freezing over. Dig out the soil, keeping it large enough for your pond liner or container to fit into. Level off the bottom and add an even layer of sand. Place the liner or container inside and fill in around it with the excavated dirt. Add some water and approximately 3-5 plants, depending on the size of your pond. Water lilies, cattails, water hyacinths, and sweet flag are exceptional choices. Conceal the outer edges of your pond with additional moisture-loving plants and rocks for further interest. Moving water adds character to the garden, and both waterfalls and fountains make pleasant accents. Garden centers and professional pond retailers offer many types of easy, do-it-yourself kits that fit nearly any budget or garden design. Waterfalls can flow over rocks or run down retaining walls. They can be formal or informal. There are numerous resources available for waterfall ideas; however, different landscapes will affect the overall design. Therefore, to achieve a successful waterfall design, be sure to choose an area and design that will fit into your specific landscape. Fountains always make wonderful additions to any type of setting, and fountain kits can make this possible. Fountains come in an array of choices to suit your personal preferences; they can splash, gurgle, spray, drip, etc. You can place your fountain just about anywhere. For instance, the bottom of a small pond or even a large container such as an urn, planter, barrel, or strawberry jar can create stunning homes for your fountain. Place the fountain pump in the bottom of your pond or container and follow the instructions included with your kit. Enhance the fountain with stones, pebbles, and plants. Hollowed-out bamboo canes can also be transformed into serene water features. For example, drill some holes in various areas along the cane. Attach the cane, in an upright position, to a submersible pump placed in the bottom of a large container, such as a half-wooden barrel. Fill with water, plug it into a nearby outlet, and relax to the soothing sounds of water trickling from the cane. You could also place a stone basin among a group of plantings. Make sure the basin is large enough to catch water. Hollow out 3/4 of a bamboo cane and cut this into two varying lengths, one long and one short, with the shorter piece hollowed only halfway. Slightly angle the hollowed end of the short cane (this is where the water runs out). Meanwhile, place a submersible pump in a reservoir behind the basin and secure in place using stones. Insert vinyl tubing through the large piece of cane, fastening the bottom part to your submersible pump. Drill out a hole near the center of the small piece of bamboo just large enough to fit the top of the larger piece inside, running the remainder of vinyl tubing through the small cane. Once secure, seal this with a waterproof sealant such as caulking (clear). Conceal the reservoir with plants. Fill both the basin and reservoir with water, plug it up, and enjoy its soft trickle effect. If ponds, waterfalls, or fountains are not your thing, even the most subtle of water accents, such as basins and birdbaths, can add a sense of peace to your garden. Birdbaths can be nothing more than a shallow dish of water sitting on an over-turned container. There are endless ways to add water to your landscape; simply use a little creativity and see what happens. The Easter Bunny is getting close to his visit and I’m always looking for new Easter-themed ideas and activities for my kids. Sure, dyeing Easter eggs and planning an Easter egg hunt are always staples, but I wanted something new and fresh. So I asked around and I’m sharing here some of the great ideas several of my teacher friends offered. Have fun with these exciting Easter activities! Matching Sound Game. Fill plastic Easter eggs with different materials such as dry pinto beans, small pasta, gems, pompoms, tiny puzzle pieces, and pebbles to vary the sounds they make. The kids pick one egg and shake it, then pick another one. If it sounds the same as the former one, put the pair in the carton side by side. If they have different sounds, just leave them off to the side. Ice Easter Eggs. Place some crafts or glass stones in a balloon, fill it with water using the tap, tie it off, and place it in the freezer overnight. You will get a beautiful ice egg. It’s very interesting to retrieve the treasure inside by cracking the eggs open. Easter Bunny Cover Up. Print out an Easter bunny face image. This is an interesting estimating game, using different sizes of pompoms to cover parts of the bunny’s face. The most challenging part is that you have to estimate how many you need. Just see how close you can be and your estimating skills can be improved in this way. Cross Toss. Prepare all the cups in a tray and insert rolled purple paper to make a cross. Throw all the purple Easter eggs in the purple cups. The kids will surely have fun and they can also improve their shooting accuracy. Easter Egg Spoon Balancing Activity. This balancing activity is so funny. Hold the handle of a wooden spoon to balance the Easter egg, and then set a distance to walk while making sure that you don’t drop the Easter egg. This idea can improve the balance ability for kids. Coin Counting Easter Activity. This will give your kids plenty of practice to count coins and match them correctly with the written amounts on these Easter eggs. 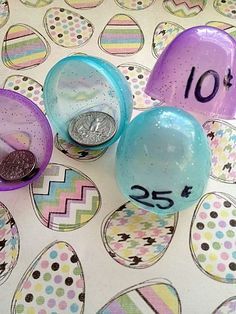 Write with marker an amount of money on each plastic Easter egg. Place change out for the children to use. For each egg they need to count and add up the money to match what’s written on the egg. Word Family Easter Eggs. If your kids have trouble memorizing words, this would be a funny and helpful Easter activity to help them learn. Make a few family eggs with different words. You can make the correct word by spinning the each half of the Easter eggs. Egg Tower Challenge. Lay out a pile of plastic Easter egg halves and instruct the kids to start building. I challenged them to see who could build the tallest tower. They counted the plastic egg halves as they added them to their towers. Easter Egg-ercise. Add an activity inside each egg. Five bunny hops, three rabbit jacks, etc. Have each child perform the activity written inside of the egg when they open it. Egg-ercises can also be done as a group.